Thomas Voeckler Might Just Do This! Rangers and Brandon Dubinsky Disagree on Contract Length. Or Is It Money? Restricted free agent Brandon Dubinsky has an arbitration hearing scheduled for tomorrow, and unless he and the Rangers can agree to a deal on their own before then, they'll all have to go through with the whole unpleasant process. The two sides have been meeting about a longer-term contract than he'd be awarded by the arbitrator, but thus far they've differed on the terms of the contract. Brandon Dubinsky's arbitration hearing is set for Thursday, and a deal does not appear close. A source has told the Daily News that the sticking point is not money, but years on a new contract. Well then. Ultimately, of course, it's about both: How much money Dubinsky wants in order to give up years of potential unrestricted free agency, how many years the Rangers are willing to commit to, and how those two factors are weighed against each other. 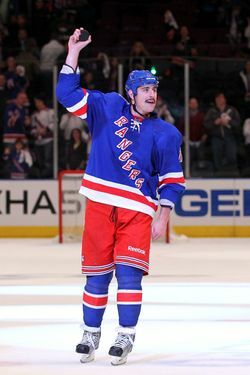 For the record, under the current terms of the collective bargaining agreement, Dubinsky can become an unrestricted free agent in two years — though Larry Brooks writes that the league is expected to seek to raise the age requirements for free agency in the next CBA, which could potentially give the Rangers control over Dubinsky's contract beyond the next two seasons. Oh, here's one other aspect of those two reports that differs: The News writes that Dubinsky is likely to emerge with a two-year contract, which makes sense. But in the Post, Brooks writes that though the Rangers have an option of electing a two-year award, "there is a sense the club may go for a one-year award." So, basically, stay tuned.